TSL1401 Linescan Imaging Sensor Product Document. TSL1401 Windows PC Host and Monitor Program. Driver Firmware for MoBoStamp-pe AVR Coprocessor. BASIC Stamp 2pe Programming Template. TSL1401 Linescan Imaging DB BS2 code. The Parallax TSL1401 Linescan Imaging Daughterboard provides one-dimensional sight to almost any microcontroller. It is designed for plug-in compatibility with Parallax's BS2pe Motherboard but can be used with other BASIC Stamp modules, the Parallax Propeller, the SX, PICs, and AVRs, to name just a few. 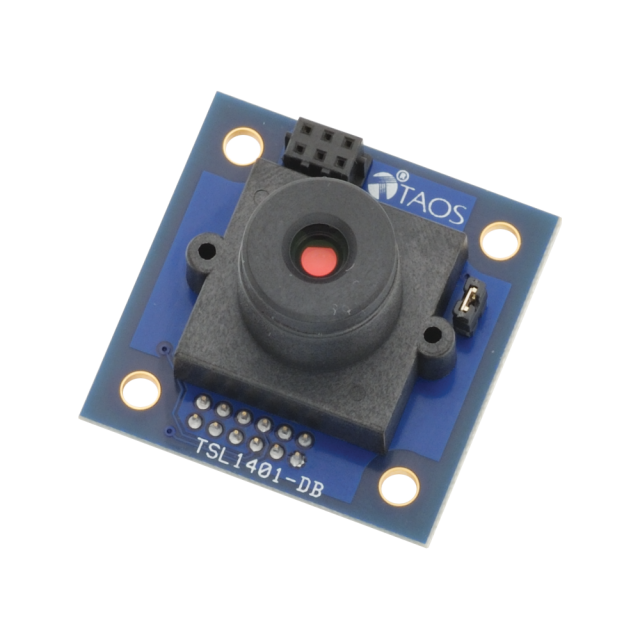 It is a platform suitable not only for evaluating TAOS's TSL1401R imaging chip, but also for incorporation into OEM products, as well as hobbyist, robotic, and educational platforms. Central to the TSL1401-DB's ease of use is the 50-page manual. The AVR coprocessor firmware for the BS2pe Motherboard, for example, provides a completely scriptable imaging front end that captures images in the background and locates features, while the BASIC Stamp is busy with other tasks. Also included is a programming template and examples for both the Motherboard and the BASIC Stamp 2. As an aid to seeing what the camera sees in real time, both for setting up and alignment and for trying various detection strategies, a PC-hosted monitor program provides both an oscilloscope view of the pixels, as well as a sweeping view of multiple scans laid side-by-side. It also includes user-selectable measurement tools for locating edges, counting pixels, computing extrema and averages, and the like. This program is designed to be used with the BASIC Stamp 2pe Motherboard and automatically uploads the PBASIC code necessary for communication. Accessory socket for future add-ons, such as LED strobes. Direct plug-in for Parallax motherboards (e.g. MoBoStamp-pe) and adapters. Focusable imaging lens: 7.9mm focal length, f2.4 fixed aperture, manual focus, 12mm x 0.5mm thread. Light and flame detection and location for robots. Non-contact measurement of height, width, diameter, position. Detection of objects, edges, gaps, holes, and liquid levels. 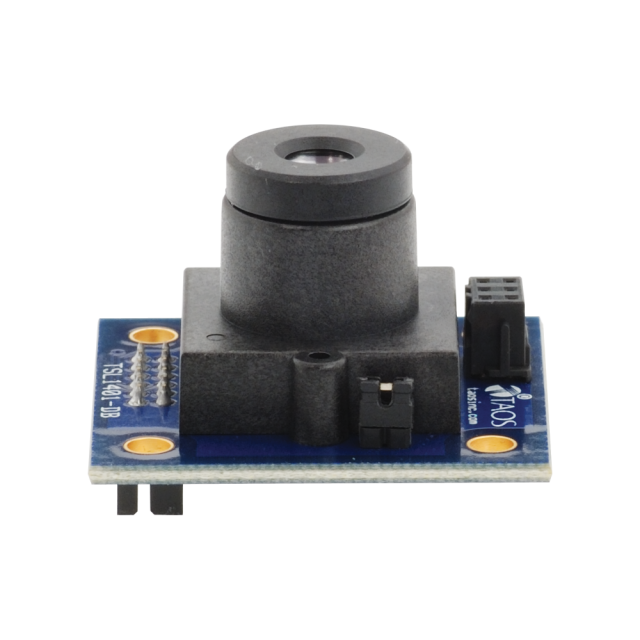 128-pixel linear image sensor (TAOS TSL1401R). Simple three-pin interface with analog pixel output. Connector: 12-pin Hirose DF11 (M) main connector, 6-pin Hirose DF11 (F) accessory connector. Exposure Time: 267µS to 68mS (MoBoStamp-pe, Propeller, SX, PIC, AVR, etc. ); 2.03ms to 68ms (BS2). Resolution: 128 pixels (grayscale); 255 pixels (interpolated binary). Power requirements: 3.3V to 5.0V at less than 5mA. Dimensions (with lens) :1.35 x 1.35 x 1.22 in (34.3 x 34.3 x 31mm).